1) Lobster and Lobster (on the Lunch Menu) at The River Cafe in Brooklyn NY. Amazing! My mom and I went to see the Telectroscope last summer and ended up having lunch at the River Cafe. It was one of the best meals I have ever had. Price first told me about HaHa’s chicken when we first started dating. He told me about this great dish from a family friend that is Chicken, Broccoli, Peaches, with a sour cream based sauce served over rice…. um excuse me? I could not believe it would be so great (or even edible) but I was REALLY proven wrong. (I’m sure Price loves that I admit when that I am wrong!) It is great right out of the oven but it is even better the next day when the flavors get to mingle together in the sauce. Well with chicken on sale I bought a bunch and the best thing to do with it is… HaHa’s! So we made it for dinner. Such a great Friday night. Especially one that is rainy and gross. Melt butter and sauté onion and garlic. Add paprika to the sautéed onions and garlic. 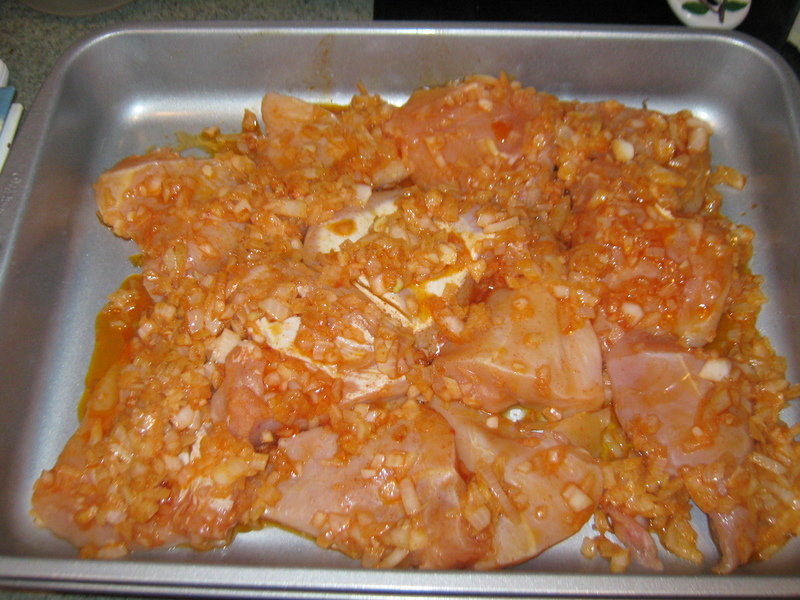 Coat each chicken breast by placing it into the onion mixture. Place all the coated chicken in a 9×13 plan. Pour remainder of butter/onion mixture over the chicken. Cover loosely with foil and bake until chicken is cooked through, about 30-40 minutes. While the chicken is cooking, steam broccoli until it is just tender. In a small bowl, mix the sour cream, mayonnaise, and parmesan cheese. Remove the chicken from the over and put your broiler on. 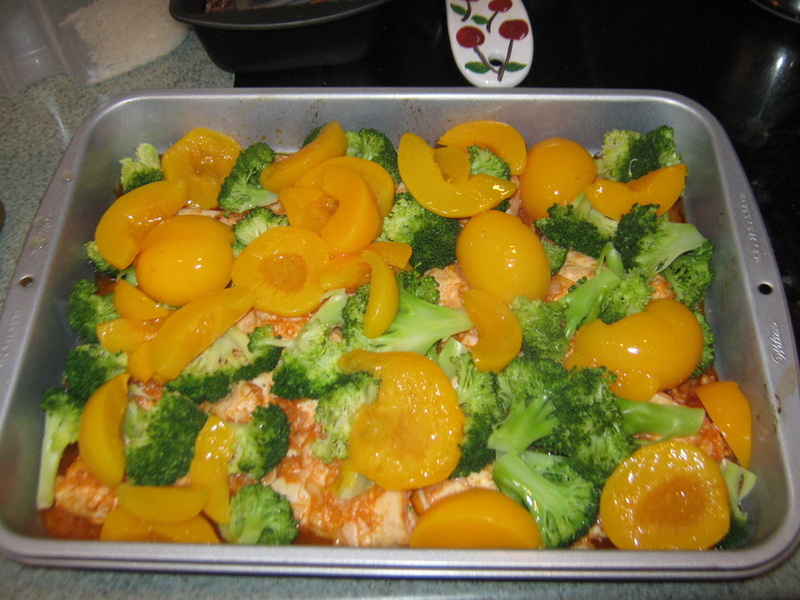 Arrange peaches and broccoli pieces among the chicken. 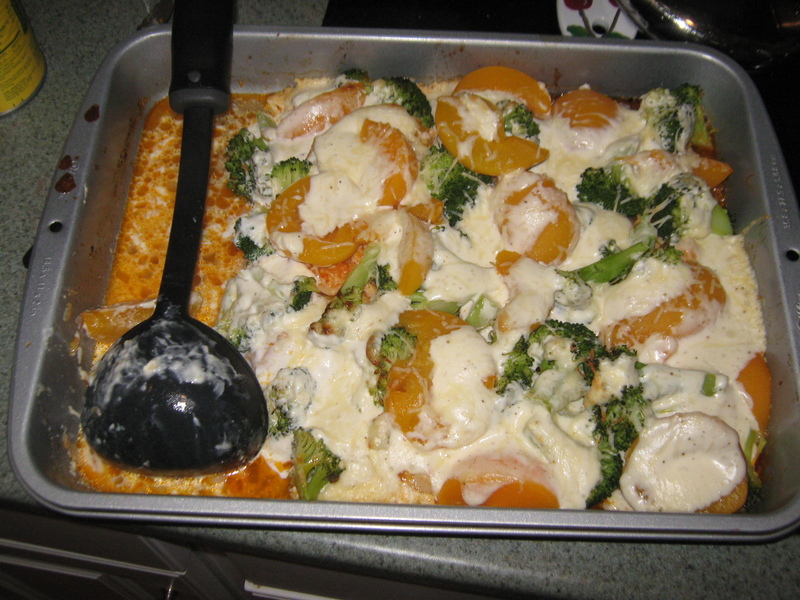 Dollop the sour cream mixture on top of the broccoli, peaches, and chicken. Return to oven and broil just until brown. Serve with rice. Chicken after it was coated in the butter/onions/garlic/paprika. After the broc and peaches are added. According to the all knowing Wiki….it seems that fried chicken is requested quite a lot.